Public Performances: The Arts and Politics of Architecture. College of Architecture cover. 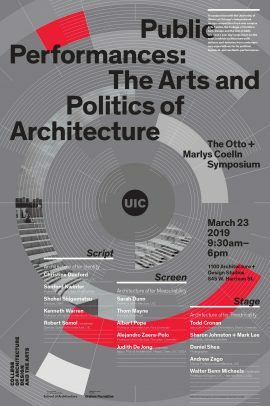 The University of Illinois at Chicago’s College of Architecture, Design and the Arts, or CADA, and the School of Architecture will host the Otto and Marlys Coelln Symposium as an examination of the ways in which architecture both addresses and changes contemporary expectations for its political, technical and aesthetic performances. The one-day symposium is being presented in conjunction with UIC’s international design competition for a new Center for the Arts. The symposium will offer panel discussions in three “Acts,” which aim to redefine the relationships between public vs. private spaces and the role of higher education as a public good. Script addresses the ways in which architecture is a form of speech: its program is always something declared rather than a mere transcript of predetermined expectations. Panelists include: Christine Dunford, UIC; Sanford Kwinter, Pratt Institute; Shohei Shigematsu, OMA; Kenneth Warren, University of Chicago. Moderated by Robert Somol, UIC. Screen looks at architecture as a mediator of urban, environmental and material interactions: its envelope channels energies beyond the metrics of its demands. Panelists include: Sarah Dunn, UIC; Thom Mayne, Morphosis; Albert Pope, Rice University; Alejandro Zaera-Polo, Princeton University. Moderated by Judith De Jong, UIC. Stage recognizes architecture’s power to include the unpredictable ways it is framed by others: it establishes a platform for appropriation that can be presented in more ways than those directed by its clients or creators. Panelists include: Todd Cronan, Emory University; Sharon Johnston and Mark Lee, Johnston Marklee; Daniel Shea, photographer; Andrew Zago, UIC. Moderated by Walter Benn Michaels, UIC. 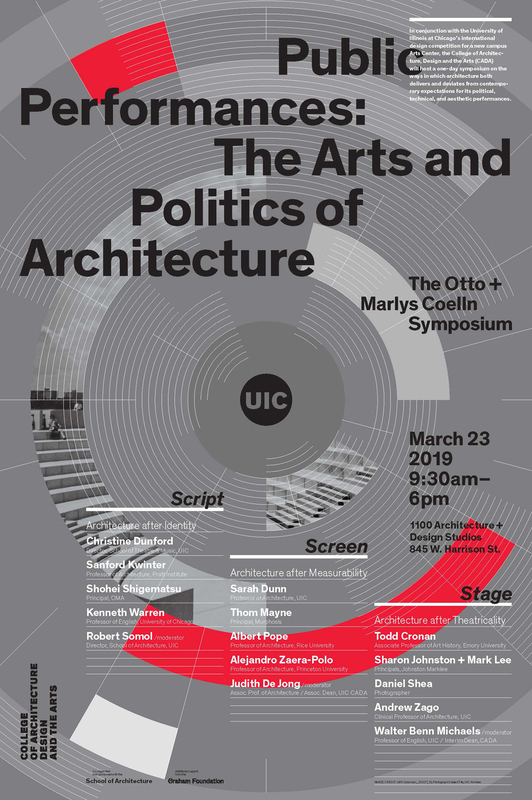 The symposium is co-hosted by the College of Architecture, Design, and the Arts (CADA) and the UIC School of Architecture, with support from the Graham Foundation for Advanced Studies in the Fine Arts. The event is free and open to the public, but registration is required by March 20 through Eventbrite. Please note that seating is first come, first served.